In working with young people, one of the most frustrating and heartbreaking things we can see are students who seem to have given up on themselves. In this week's Try It Tuesday, we are going to look at one explanation for that behavior that comes from extensive research into the impact of our mindset on our ability to grow. Dr. Carol Dweck has done a great deal of research into how mindsets impact our ability to grow and learn. She has discovered that in dealing with various life domains, we can have either a "fixed mindset" or a "growth mindset," as illustrated in the graphic above. The "fixed mindset" is a belief that qualities such as intelligence, creativity and personality are fixed traits that cannot be changed. In the growth mindset, on the other hand, we believe that we can develop our basic qualities. Yes, we may have various aptitudes and talents, but through effort and experience, we can grow our basic abilities. As the graphic at the top of this post demonstrates, each of these mindsets leads to a series of behaviors that can have a profound impact on student learning. The fixed mindset creates an urgency to prove yourself over and over again and any negative feedback is perceived as an attack on your character. The growth mindset, on the other hand, encourages effort and learning. If you truly believe that you can grow, then you recognize that through practice and experience you can develop your intelligence, your creativity and so forth. Watch the short video below for more information on these two mindsets and their impacts. In working with young people, we want to encourage them to adopt the growth mindset about things like intelligence and creativity. We want to help them to see that these are NOT fixed traits, but, in fact, aspects of ourselves that we can develop through learning and practice. So how do we do this? Here are some ideas. . .
Test your own beliefs--Take this short mindset quiz and see where you land. If you have a fixed mindset, especially when it comes to working with your students, then you'll want to do some more reading and research to understand exactly how this might be influencing your work with young people--and with yourself. Introduce your students to Dweck's research--Share with them some of the video, audio and other resources listed at the bottom of this post and have a discussion about fixed vs. growth mindsets and how they might be influencing them. You might want to have them take the quiz above and then use the results as a jumping off point for discussion. Help them to understand how their mindset might be influencing them and discuss ways that they can start changing their approach. Praise students for effort and hard work, not for being "smart" or "creative"--One of the most important ways we can help young people start making the shift into the growth mindset is by showing them the connection between their effort and their achievement. If they do well, then show them that it was a result of their effort. If they are less than successful, make the link between lack of effort and their lack of success, making it clear that it's the hard work and persistence that make the difference. Teach students the 4 steps for changing to a growth mindset and reinforce these regularly--These include recognizing when your internal monologue is using a fixed mindset "voice," talking back to it with a growth mindset, and then taking growth mindset actions. This is a strategy that you can embed into both classroom interactions, as well as into your individual coaching and work with students. Be mindful of your own fixed and growth mindsets and share these stories with students. We are not immune to the fixed vs. growth mindset beliefs, so it's helpful if we work alongside students to see where we may be fixed and need to make a shift into growth. Pay attention to the domains of your life where you may have more of a fixed mindset and share this with your students. Discuss how you can work to shift into growth and what efforts you have made in this direction. This is a great place for modeling the 4 steps for change so that young people see how it can work in their own lives. Fixed mindsets develop over time and it will take time for young people to adopt more growth-oriented beliefs. Look for ways to embed this work into your daily practices with young people so that they are regularly looking for ways in which they are growth-oriented and further developing their growth mindsets. Brainpickings Summary of Mindset--good summary of Dweck's book. 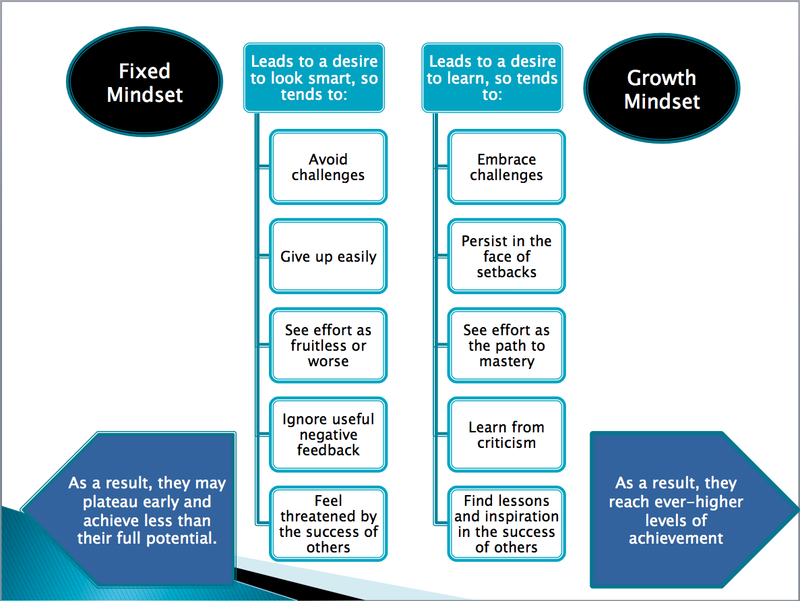 Dweck's Mindset Website--Includes links to some good articles and podcasts. How Not to Talk to Your Kids--great article!